Happy Diwali guys. 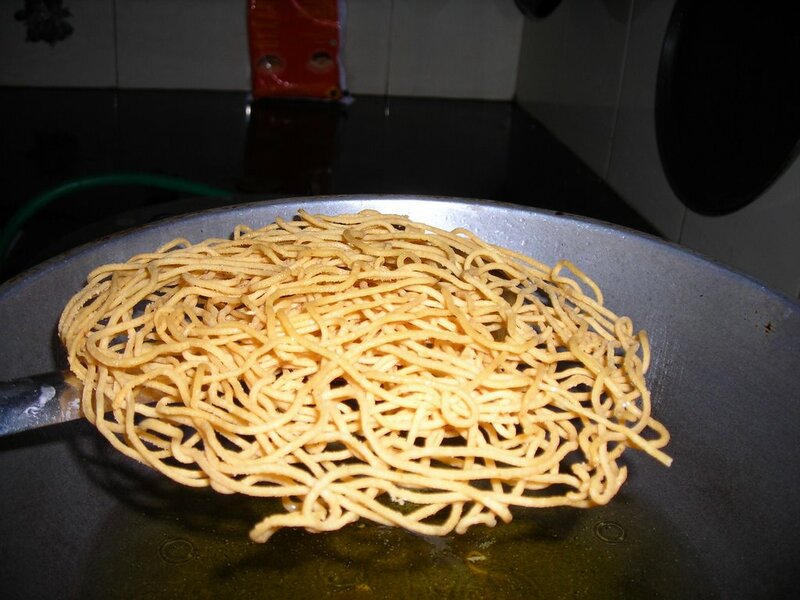 It has been ages since I posted any recipe at all. So I decided to reopen my blog for regular updates starting this Diwali season. I also decided to make my first Diwali snack, called Ompodi. 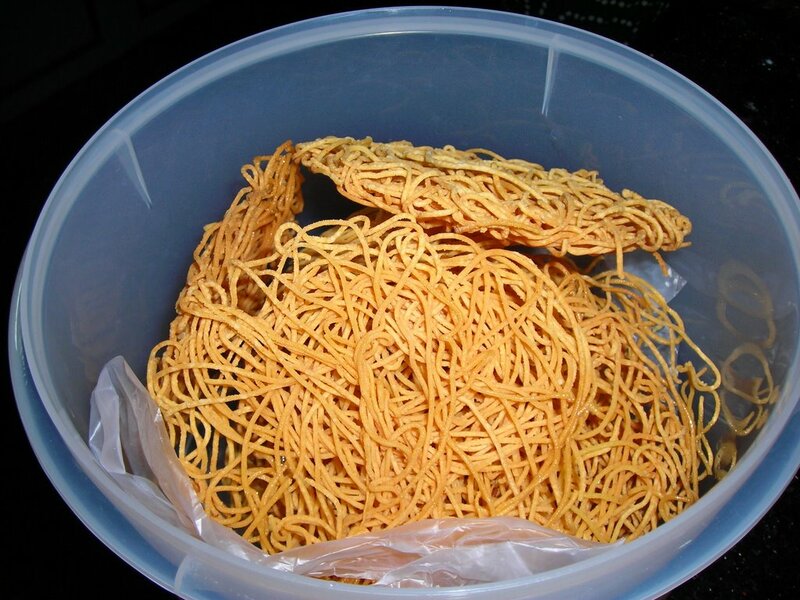 It is taken as a snack during tea time as well as used as a garnish for Bhelpuri. My mom helped me while I was photographing as well. Thanks mom! 1. Mix all the ingredients in a bowl and knead well. 2. Stuff a small portion dough in the ompudi mould. 3. Place the perforated disc at the bottom of the mould. 4. Heat oil to a moderate temperature. 5. 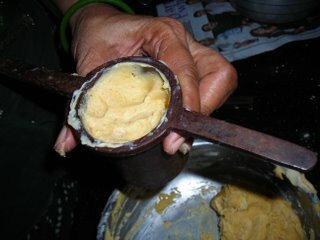 Once it is hot, take the mould with the dough stuffing and press down evenly, in a circular motion, so that the ompodi is cooked uniformly. 6. Cook until it turns a light golden brown. 1. Ensure that the portions are perfect. Otherwise the dough will break while frying. 2. 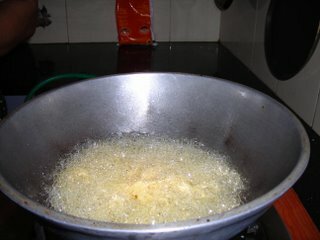 If you are using salted butter, then reduce the addition of salt to the mixture. 3. While adding water, ensure that the dough consistency is neither too sticky or watery. It should be of a consistency required to make bread or roti. Happy diwali Soumya. Glad to see you back. Let me give you a personal invitation to participate at VCC Q3 2006. We have extended the deadline to October 31. See you at the VCC show. Cheers! Welcome back. Nice to see your post after long time. 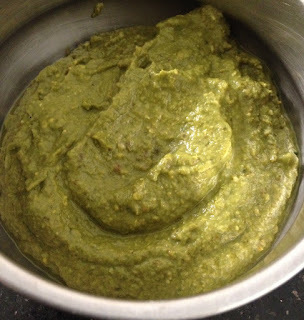 Your ompodi looks nice.Thanks for sharing your recipe.